Barmas of Old Ryazan, One of the greatest masterpieces of ancient jewelry were produced by masters of Old Ryazan in late 12th - early 13th century. They belonged to the local prince's family, but in 1237 the city was completely destroyed by Batu Khan, and the jewelry lay underground for nearly 600 years. In 1822, the royal barmas were found by archeologists and brought to the Armory. These precious barmas are proof of the high level of local jewelry, enameled with their precious stones, gold medallions decorated with engraving. Medallions on one of the sets have a picture: The Crucifixion with the Virgin and John the Baptist, Virgin, Martyr Irene and Barbara, in royal attire Saints and others of the medallion has a Greek inscription, it is likely these parts have Byzantine origins. "Cap of Monomakh" The oldest crown is the "Cap of Monomakh" or Crown of Monomakh, used in the ceremony of crowning a monarch in Russia. Its name is connected with a Russian legend of the 15th century, according to which it has been brought to Russia in ancient times as a gift from the Byzantine Emperor Constantine Monomachos. The cap is of oriental workmanship of the late 13th or early 14th century. The question of its origin is still unspecified. The oldest section of the crown consists of eight gold plates adorned with very fine gold lace in a pattern of six-pointed rosette-stars and lotus blossoms. The semi-spherical top with a cross, the sable trimming and the pearls and gemstones belong to a later period. It weighs 698 grams and is the lightest Russian crown. Since the late 14th till the late 17th century, the Cap of Monomakh a symbol of power, was used in the ceremony of setting the ruler of the Russian State for reigning. 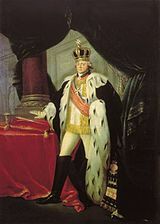 In the first quarter of the 18th century, after Peter the Great's reforms, the ceremonial setting for reigning was replaced by coronation, the main attribute of which became imperial crown. Since 18th century the Cap of Monomakh served as heraldic crown of the "Tsardom of Great, Little and White Russia". Kazan crown The Crown of Kazan belonged to Ediger Mahmet, the last ruler of the Tatar (Tartar) state of Kazan. This 16th century crown is the second oldest in Russia. The gold crown is studded with pearls, garnets, and turquoises. The sable-fur trimming was for comfort. The Kazan Crown is dated by 1553. It was first mentioned in the treasury of Tsar Ivan the Terrible, whose reigning was signed by a series of eminent events in the Russian history. Among them is the capture of Kazan in October 1552 and annexation of the Kazan khanate to the Russian state. 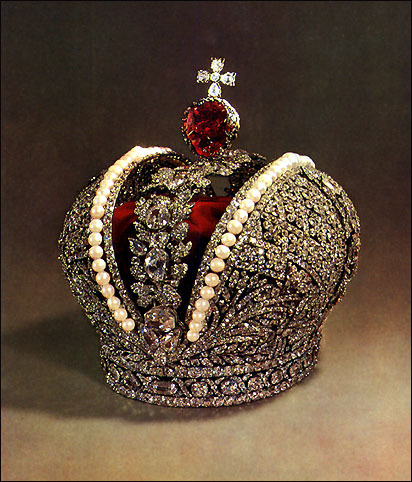 The precious crown might have been executed by Moscow Kremlin jewelers on the successful solution of "The Eastern problem", so important for Muscovy. Its name might have immortalized the memory of the glorious victory of Russian warriors. 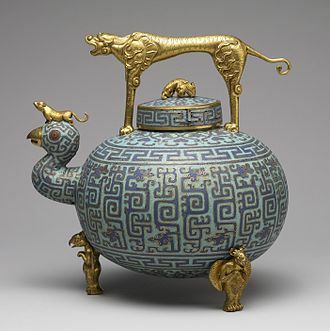 The crown's look combines national and eastern artistic traditions. Some elements remind decor traditions of Russian churches of the epoch. At the same time, combination of stones, e.g. red tourmalines and rubies with blue turquoise and carved ornament of knitting herbs on niello background represent oriental artistic influence. Since 18th century this crown served as heraldic crown of the "Tsardom of Kazan". Ivory throne This is earliest survived tsars throne of the mid-16th century. 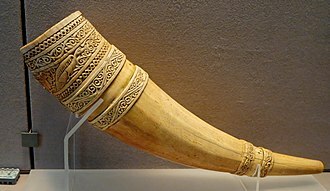 This fine specimen of Renaissance culture was made of wood faced with plates of ivory and walrus tusk therefore it was called the "carved bone armchair". The carved ornament unites the various subjects and representations into a single composition. 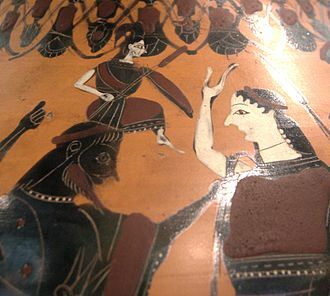 Decorative scenes include images from Greek mythology and the Old Testament. 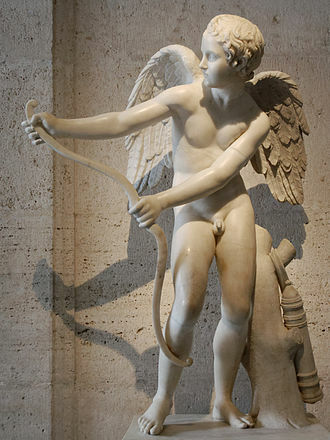 The depicted themes, the style of the carving and the motifs, which include grotesques and Cupids, enable researches to date most of the pieces to the 16th century and attribute them to Western European Renaissance craftsmen. This bone throne has been renovated several times in Russia: worn pieces of bone were remade by local craftsmen; in 1856, on the occasion of the coronation of Emperor Alexander II, the throne was decorated with a gilded silver two-headed eagle. Golden throne In addition to the bone chair the showcase includes a throne of oriental workmanship executed in the late 16th century. Having been presented by Shah Abbas I to Tsar Boris Godunov it was called a "Persian throne with stones". The form of the throne with its low back flowing into sloping arm-rests, reveals features typical of Iranian furniture of the 16th-17th centuries. The makers have used ornament beloved in the East, i.e. strips of gold decorated with a foliate pattern and coloured stones - blue turquoises and red rubies, tourmalines. The back of the seat, the arms and the whole lower section of the throne were covered with gold Persian fabric, replaced by French velvet in 1742 for the coronation of Empress Elizabeth. In total this throne is adorned 552 rubies and pink tourmalines, 825 turquoises, 177 pearls and 700 halves of pearls. Scepter and orb are magnificent creations of West-European jewelry of Late Renaissance. By the way, the enamels on relief technique was not known to Russian goldsmiths of that time. There are reasons to consider the scepter and orb to belong to the set of gifts, brought to Tsar Boris Godunov in 1604 by the Great Embassy of Rudolf II, Emperor of the Great Roman Empire. 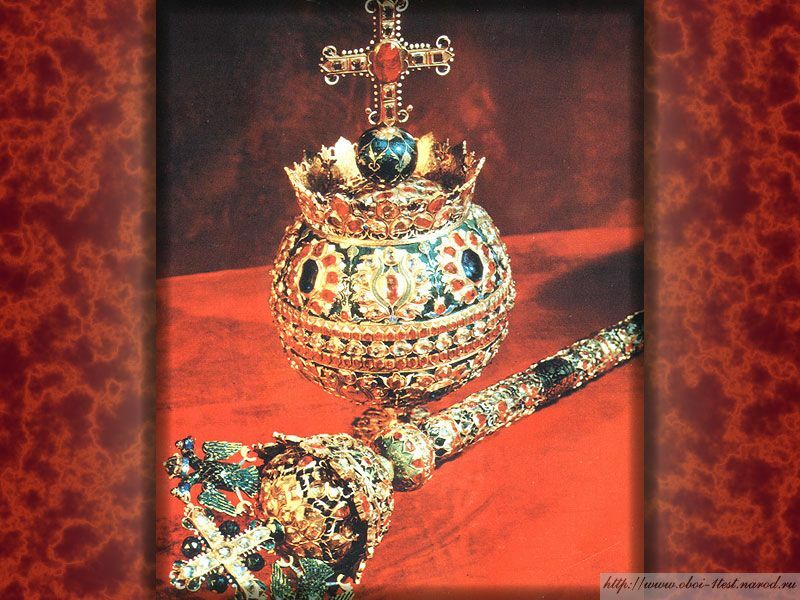 The scepter and orb, miraculously survived through the Time of Troubles, must have been used in 1613 in crowning of Michael Fyodorovich, first Tsar of the Romanov Dynasty. For later on during the whole reigning of Michael Fyodorovich they were unique regalia of the kind and belonged to the so-called "Grand set" (precious tsars attire) complex of especially valuable regalia. 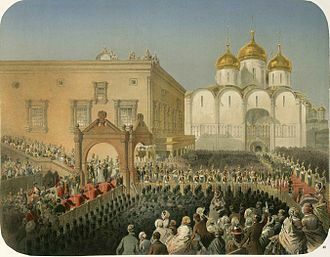 Later "Grand set", which, except for the state regalia, included an armour set, that accompanied the Tsar in processions, e.g. military companies and hunting. The sceptre The golden scepter is graceful and proportional, with rich and dainty ornamental motifs. The heads of cherubs, flowers and clusters of fruits suspended on ribbons – everything belongs to a unique, rhythmically sized composition. This ancient sceptre has 1 emerald, 20 diamonds and a few other precious stones. The orb Huge golden orb is crowned with a cross. In the upper hemisphere girdles separate it into four sections each with an Old Testament scene from King David's life: "Chrosmation of King David by Prophet Samuel", "David's mastering Goliath", "Coming home with the victory", "Persecution from Saul". Shining gems, green emeralds, red rubies, and blue sapphires, encircle the enamel ornamentation. The Orb has 58 diamonds, 89 rubies and tourmalines, 23 sapphires, 51 emeralds and 37 pearls. Except for the 4 enamels, the entire orb, including the cross, is thoroughly encrusted with the various gems. The crown of "Grand set" - "Astrahan crown"
Golden carving chain This chain was presented to Tsar Michael Fyodorovich in 1631 by the Dutch. It was made in Western Europe in 1620s, later in Russia it was altered and became part of the "Grand set". It consists of 79 carving blackening rectangular links. Golden chain The golden chain belonged to Tsar Michael Fyodorovich. 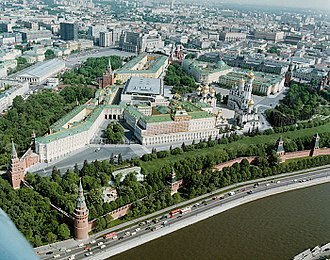 It was executed by Kremlin makers and first mentioned in papers of the State treasury in 1640. It consists of 89 rounds, slightly convoluted rings with an ornamental inscription on each ring. The inscription includes a praying to the Holy Trinity, the complete title of the Tsar with a list of towns, princedoms and lands of the Russian State and the Tsar's hortation to live according to the precepts of God. The crown The crown of "Grand set" belonged to Tsar Michael Fyodorovich. It was executed by Kremlin master E.Telepnev in 1627. Crown has 177 precious stones and pearls. Since 18th century this crown served as heraldic crown of "Tsardom of Astrahan". Golden throne The throne of Tsar Mikhail Fyodorovich was executed at the beginning of the 17th century from the old chair of oriental workmanship which had belonged to Ivan the Terrible. In its form, high back and arms, it resembles Russian armchairs, but oriental motifs still remain in the ornament: The throne is faced with embossed gold and adorned with rubies, pearls, turquoise and other uncut stones. The throne was made in the early 17th century in Kremlin Workshops. Its decoration is similar to that of the throne of Boris Godunov. 13 kilos of gold, gemstones and pearls were used for its ornamentation. Partly throne's decoration haven’t survived. A part of golden plates in the base as well as the throne's pediment were missing. 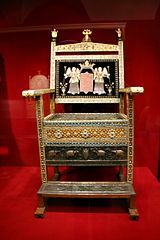 In total on this throne are surviving 1325 rubies and tourmalines, 559 turquoises, 16 pearls, 28 sapphires and 36 other precious stones. 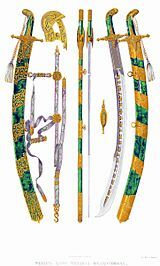 Saadak and quiver Saadak (precious bow-case) of "Grand set", in complect with quiver, was executed in Kremlin c.1627: In total saadak and quiver are adorned 183 diamonds, 5 rubies, 34 sapphires, 153 emeralds and 139 tourmalins. Shield This precious steel (with carving gold designs) shield was made by master Muchammed Mumin Zernishan in Persia in late of the 16th century: Until 1620 it belonged to prince Fyodor Mstislavsky (former Semiboyarzchina Head), after his death it was taken to Kremlin Armoury and became part of "Grand set". It is adorned 1478 small gemstones and 32 pearls. Sabre Sabre of "Grand set" was made by Kremlin masters in the 1620s. It very rare artefact has 552 diamonds and 165 other precious stones, mostly pink tourmalins. "State helmet" This helmet - "ericho cap" - was made in Turkey in the 1600s, and altered in 1621 in Kremlin Armoury by masters N.Davydov and I.Markov, and later in 1642. 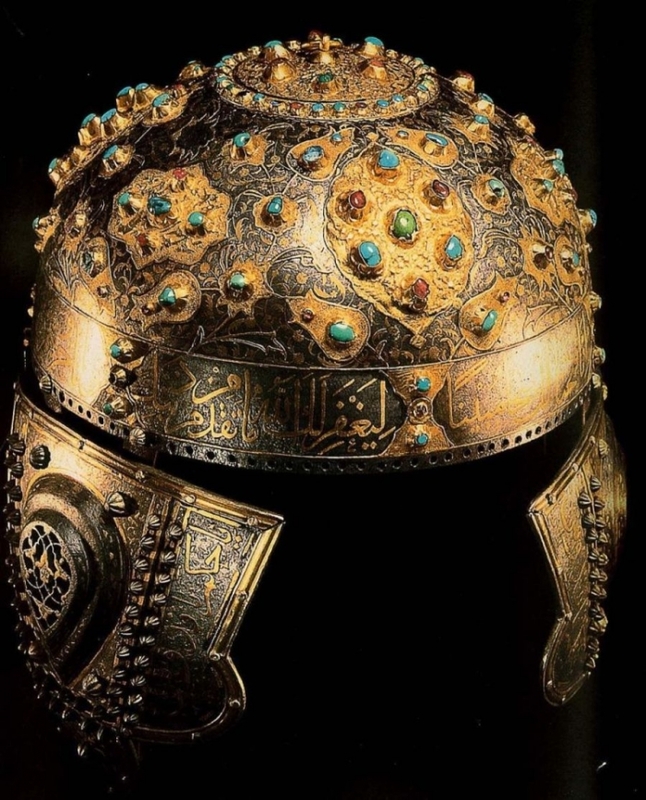 Steel helmet with golden carving, it has Turkish inscription - quotations from Qur'an. It is adorned 116 diamonds, 10 emeralds, 225 tourmalines and 164 pearls. By latest legend, this regalia belonged to Saint Alexander Nevsky. Since 18th century it served also as heraldic Helmet of Russian Empire. Broadsword of Tsar Michael Fyodorovich on picture, 19th century. Broadsword Broadsword was executed by master Czech Nil Prosvit in Kremlin Armoury in 1617. It has inscription: «Sy tesak sdeelan poweleniem Gossudara Tzaira i welikoвo Knesa Michaila Feodorowitcha vsea Rrusyi v paetoie leeto gossudarstwa ieвo, maesetza... Po prikasu kraitscheвo y oruschnitscheвo Michaila Michai-lowitscha Saltikowa; deelal master Nial Proswit». Sabre Sabre of prince Fyodor Mstislavsky after his death in 1620 was taken to tsars treasury. It is made in Turkey in 16th century and has Arabian inscriptions. Helmet Unique precious helmet of prince Fyodor Mstislavsky, is made of damascene steel and gold in Ottoman Empire in the 16th century: In 1620 it was taken to tsar's treasury. Helmet is adorned rubies and turquoises and has quotations from Koran. ericho cap "Ericho cap" of prince Fyodor Mstislavsky. Ottoman Empire, 1600s. ericho cap "Ericho cap" of prince A.M. Lvov. Made in Ottoman Empire probably in 1610s-1620s. The sceptre Sceptre was executed in Istanbul in 1658 and presented to the Tsar by a Greek Ivan Anastasov: This oriental sceptre has mace form. It has 268 diamonds, 14 emeralds, 360 other precious stones. Golden handle has 12 small carved medallions this pictures of great Christian holidays: The Annunciation, The Ascension of Jesus, Christmas Day, Feast of the Presentation of Jesus at the Temple, Epiphany, Raising of Lazarus, The Transfiguration of Jesus, Palm Sunday, The Crucifixion of Jesus, Resurrection of Jesus, Pentecost, Assuring of St Thomas. The orb In archives there are records the orb with already mentioned barmas were brought to Tsar Alexis Mikhailovich by a Greek Istanbul citizen, Ivan Yuriev in 1662: It has 179 diamonds and 340 other precious stones. 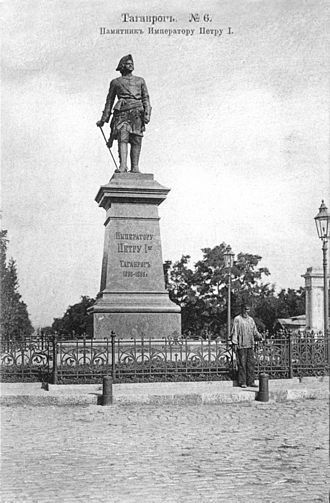 Barmas Barmas of Alexis Mikhailovich executed in Istanbul on his order in 1662. It is a round silk collar, adorned with seven precious medallions. The centre of medallions are round golden plates with religious compositions of colour enamels. Three large medallions are of particular interest. Two of them are not plane, like all the others, but a little bossy. They were to cover shoulders. The shape of the third medallion is a bit different, so it can be considered a central one. It is adorned with a scene of Our Lady sitting with a Baby in her lap, crowned by two angels. One shoulder medallion includes a cross confronted by Saints – Byzantine Emperor Constantine and his mother Helen, who were famous devotees of Christianity. Another shoulder medallion presented Basil the Great and Saint Warrior Mercury, piking Emperor Julian, enemy of Christians. A legend says he was killed by Saint Mercury, who pretended to be an enemy warrior. The precious holy of the 17th century may have hinted the role of the royal power in the Christian world and the mission of the very Russian Tsar. In total all 7 precious medallions have 248 diamonds and 255 other precious stones. Diamond throne of Tsar Alexis Mikhailovich, in Kremlin Armoury. Diamond throne The shape of the so-called "diamond armchair" of Tsar Alexei Mikhailovich, the most elaborate of the Royal thrones in the Armoury collection, is reminiscent of the throne of Tsar Mikhail, his father. 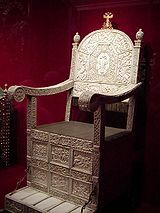 The throne was made by Persian makers in 1659 and granted to the Tsar by merchants Ichto Modovletov and Zakharia Saradarov from the Armenian Trading Company in 1660. The throne has been made of sandalwood faced with golden and silver plates with foliate ornamentation. Its bottom is decorated with a bold carved pattern depicting a procession of elephants and drivers on their backs. The back of the throne is covered with black velvet and embroidered images of two genii supporting a crown over the inscription glorifying the Tsar and his power. The whole surface of the throne is faced with an intricate mosaic of turquoise and diamonds. The precious donation was attached to the petition of tax-free trading in the Russian territory. The Armenian merchants got 4000 silver rubles and 19000 copper rubles for this throne. For the prevalence of diamonds the throne was named "Diamond Throne". In total throne has 876 diamonds and 1223 other gemstones. On the back of this throne there is an embroidered Latin inscription: "Potentissimo et invictissimo Moscovitarum Imperatori Alexio, in terris feliciter regnanti, hic thronus, summa arte et industria fabrefactus, sit futuri in coelis et perennis faustum felixque omen. Anno Domini, 1659" ("To the most powerful and invincible Muscovy Emperor Alexis doth reign felicitously upon the earth the throne made with sumptuous art would be a token of future eternal bliss in heaven. In the Year of Our Lord. 1659"). The staff "His Majesty's staff": This precious staff was executed in Istanbul in 1658 and presented to Tsar by a Greek Ivan Anastasov in 1662. It has a lily in top. In total this unique oriental staff has 178 diamonds, 259 emeralds, 3 pearls and 369 pink tourmalines. Plaque-pendant Precious plaque-pendant for tsars coronation clothes was executed in Istanbul in the 1660s. Saadak and quiver Precious saadak in complect with quiver was executed in Istanbul and presented to the Tsar by Greeks Ivan Yuriev and Dmitry Astafiev in 1656: In total unique oriental saadak and quiver have 306 diamonds, 40 emeralds and 1256 tourmalines. 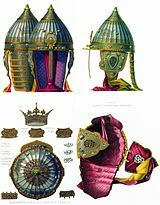 Helmet Helmet-"ericho cap" of "Grand set" was made in Turkey in the 1600s, until 1620 it belonged to prince Fyodor Mstislavsky and later - to Tsar Alexis Mikhailovich: It has golden and silver designs and 61 pearls and gemstones. Concir State sword-concir in golden sheath was executed in Istanbul and presented to Tsar Alexei Mikhailovich by Greek Dmitry Astafiev in 1657. Concirs sheath is adorned by 63 tourmalins and 205 turquoises. Busdychan The mace-busdychan of "Grand set" was executed in Istanbul and presented to Tsar Alexei Mikhailovich by Greek Dmitry Astafiev in 1655. It has 46 emeralds and 109 pink tourmalines. Pectoral cross with a chain This cross was executed by Kremlin masters in 1662 and altered in 1682. Only this regalia survived from "Grand set" of Theodore Alekseevich - elder son of Alexis Mikhailovich. It is golden cross with diamonds, with golden chain. On facial side of cross there is 4 enamelled medallions this pictures of: The Transfiguration of Jesus, The Crucifixion of Jesus, Last Supper and Entombment of Jesus. On the verso of the cross there is an image of a heaven protector of the Tsar - Theodore Stratilates. The figure of the Saint, floral pattern around it, as well as religious scenes on the obverse of the cross are executed in bright shining colours, which make all the compositions similar to a multicolour shining mosaics. In 1682 Russia received two so-rulers - Ivan V Alekseevich and Peter I Alekseevich. Both of them had own jewels (but one throne). Silver double throne The Double throne of Tsars Ivan Alekseyevich and Peter Alekseyevich, which serves as a vivid illustration of the unique historical moment, when two tsarevitches were crowned together: Tsar Alexis died leaving three sons. After the death of the eldest one, Theodore, fifteen-year-old Ivan should have inherited the throne, but he was feeble-minded and in poor health. So it was decided to crown the two brothers together, Ivan and ten-year-old Peter (the future Peter the Great). The double-seated throne was executed specially for the occasion by the Kremlin craftsmen in the 1680s. 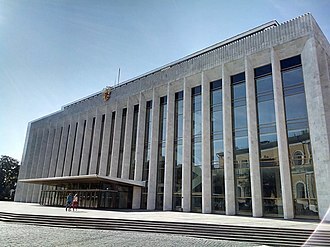 Its constriction including open-work arch on twisted columns, silver steps below and a high back with two silver pillars on each side resembles elegant architectural forms. The necessary instructions and advice were transmitted through a small orifice cut into the back of the throne and concealed by the velvet covering. The shape of the throne is finished with a lavish ornamentation. The openwork embossment, three-dimensional animal figures, carving and high relief, contrasting combination of silver and gilt are exemplificative of the Baroque style. Old Believer Priest Nikita Pustosviat Disputing with Patriarch Joachim on Matters of Faith. Painting by Vasily Perov(1880). Behind - stand silver double throne. Cap of Monomach of second set Simple "cap of Monomakh of the second set" of Tsar Peter I Alekseevich was executed by Kremlin Workshops for the 1682 crowning ceremony, when two small sons of Alexis Mikhailovich – Ivan and Peter – were inaugurated as Tsars: The creators did their best following the ancient original. It reminds an Eastern headdress and consists of 8 golden plates. The crown has a dome-shaped top with a cross. However, there is certain difference in artistic decoration of the two crowns. The surface of the ancient one is covered with a delicate filigree ornamentation. The golden plates of the new crown were left smooth. Cold shining metal with sharp symmetric decor makes impression of elegant severity, a bit mildened by bright and colourful precious stones. Since 18th centhury this crown served as heraldic crown of Tsardom of the Chersonnese Taurics. Altabas crown Altabas crown of the third set of Tsar Ivan V Alekseevich was executed by Russian masters in 1684. Altabas is a precious cloth, similar to brocade. So the crown was named altabas. It is the only tsars crown executed of cloth. For the crown would not lose the shape, it had an inner frame of smooth silver arches. The crown was adorned with golden plates enameled with bright colours and coloured with gems. Some of these plates were taken from the not survived Diamond Crown of Tsar Theodore Alekseevich. In total it has circa 100 gemstones and pearls. Since 18th century this crown served as heraldic crown of "Tsardom of Siberia". Picture of altabas crown, c. 1835. Diamond crownThis crown was executed by Russian masters for Tsar Peter I Alekseevich in the 1680s: A similar crown was made for his elder brother, crowned at the same time. The decor of the crown represents specific features of Russian jewelry of the late 17th century, a specific feature of which was active using of precious stones. Shining diamonds and gems always attracted attention of Russian goldsmiths, and that time they became the main point of jewelry artworks. The Crown of Peter Alekseevich was enriched with green emeralds and red tourmalines. In total metallic golden frame of crown is adorned 807 diamonds (in 32 designs) and 13 other gemstones. Diamond crown One of the two crowns was made in the 1680s by Russian jewelers for Ivan V Alekseevich: The decor of the crown is traditional for Russian jewelry of the late 17th century, a special point of which was active use of luxurious precious stones. On the crown's top there is a precious crimson lal. This golden crown has circa 900 diamonds and a few other precious stones. Young Russian Tsar with "Cap of Monomakh", sceptre of Alexis Mikhailovich and orb of Boris Godunov. Pectoral cross of Tsar Peter I Alekseevich The golden cross of Tsar Peter Alekseevich was made in Kremlin workshops in the 1780s. In the center of its obverse there is a small cross made of magnificent emeralds of different cutting and shape, adorned with openwork vegetation ornament and enamels. The shape and decor of the emerald cross allow to classify it as an artwork of West European silversmiths of the 16-17th centuries. A carved crucifix on one emerald and a carved inscription "NIKA" on another are of Russian origin and can be dated by the same time.On the cross's reverse there is a front enamelled image of Apostle Peter, the Tsar's patron Saint. The enamelled decor of the cross in combination with shining precious stones give major impression in accordance with the common tendencies of development of Russian art of the time. The bright artistic concept and brilliant craft make the item a true masterpiece of the 18th century jewelry. Sceptre of Tsar Peter I Alekseevich The sceptre belonging to Tsar Peter I was made of gold and adorned with colour enamels and precious stones. The hexahedral sceptre divides into three with three bolsters and its lower part ends with a bolster with a figured knob. The sceptre's form and details are close to the sceptre of Tsar Michael Fyodorovich of the 17th century. The decor reflects artistic taste of the late 17th century. Black and pink enamels on blue background, vegetation ornament of miniature graceful tulips, leaves and curls – all these have analogies in artworks by Kremlin jewelers of the 1780s and 1790s. The sceptre must have been executed in 1682 on the occasion of setting for reigning of brothers Ivan and Peter Alekseevich. While the ceremonial, Ivan Alekseevich took the sceptre of his grandfather, and the new sceptre, created following the pattern of the worshipped holy, was brought for the younger Tsar, Peter Alekseevich. Mace The mace of "Grand set" appeared only 15 March 1692. It was presented to Tsar Ivan V Alekseevich by Persian Shah Suleiman among ambassador Sulein-Han. Golden oriental mace, it adorned by precious stones, total length 71,8 cm. In 1790 prince G.Potyomkin (who was also chief of Kremlin Armoury) take it instead of marschallstab, after his death the mace was returned to Kremlin. 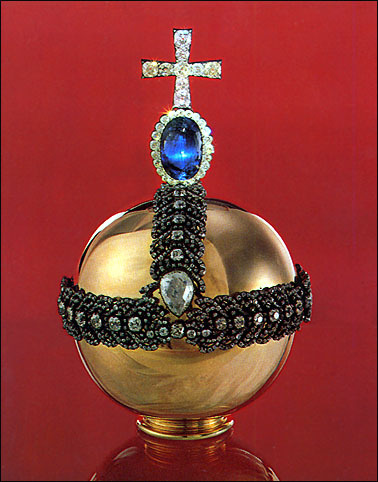 Orb of Emperor Peter II Simple small golden orb with silver belt and cross, without gemstones. It was given to Kremlin Armoury 30 May 1728. 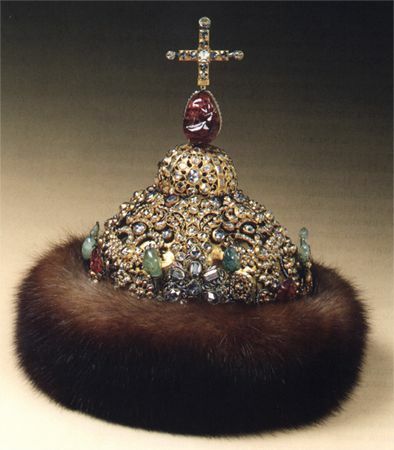 Crown of Empress Anna Ivanovna is one of the first new-type Russian crowns and was executed by Gottlieb Wilhelm Dunkel in St. Petersburg in 1731 for Empress Anna's coronation ceremony. It was altered in the 1730s. The crown is made of silver and adorned with 2536 diamonds, 28 other gemstones and one huge red tourmaline in c.500 carat. The form was to become traditional: two open-work hemispheres divided by a movable arc with a cross in the middle and a broad circlet. This regalia was given to Kremlin Armory on 14 March 1741. In 1826 it was used for the personal coronation of Emperor Nikolas I in Warsaw as the polish king. Later this crown served as the heraldic crown of "Tsardom of Poland". Agraf Agraf (precious fastening for imperial mantle) was made by master J.A. Debiulon for Empress Elizabeth in SPb in 1756. It has 805 diamonds. Now this agraf is in Diamond Fund. Empress Anna Ivanovna with her crown, portrait by Louis Caravaque. 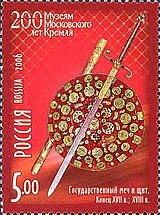 State sword and shield on Russian post stamp. The Great Imperial Crown is the largest of Russian the crowns. It was made in SPb by G.F. Ekart and J.Pauzie in 1762, in 1797 crown was altered by L.D.Diuval: It has 4936 diamonds, 75 huge pearls and one huge red spinel in 398, 72 carat. naw crown saves in Diamond Fund. The Imperial sceptre is now in the Diamond Fund. It was executed by masters L.Pfisterer and I.Leontovich for Empress Catharine II in SPb in 1771 and altered in 1774. Golden sceptre has famous diamond "Orlov" and 196 another diamonds. Imperial orb The Imperial orb is now in the Diamond Fund. It was executed by master G.F. Ekart for Empress Catharine II in Moscow in 1762 and altered circa 1774: Golden orb has diamond belt and cross with huge sapphire in 195 carat. In total there are 1370 diamonds. 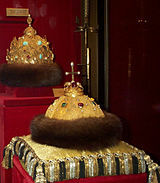 Maltese crown of Emperor Pavel I in Kremlin. Pavel I as Grand Master of Knights of Malta. Portrait by Salvatore Tonci. 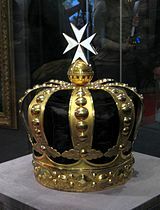 The Maltese crown of Emperor Pavel I, and other Order's relics, were presented to Pavel I in 1798 by the Knights of Malta when he was elected as Grand Master. This regalia was made by stamping gilded silver, surmounted by a golden sphere and golden enamelled "maltese" cross. Until 1803 it also served as the heraldic crown. 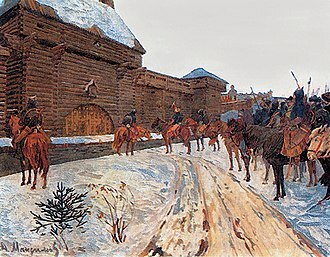 In 1827 it was given to the Kremlin Armory. Total weight - 1753,00 gr. Sceptre of Emperor Pavel I Golden enamelled was the personal sceptre of Emperor Pavel I: Probably, it was paired with the Maltese crown but has not survived "Georgian Crown", made in 1798. The State sword appeared only in the late 18th century, in Pavel I's time. An old polish steel blade (late 17th century), with a newly gilded silver sword-hilt, was used to make it. Total length with a haft - 141 cm. The State shield was made by Russian masters in the late 17th century, but it only became the state regalia in Pavel I's time. This shield is adorned by carving golden and silver designs with more than 150 gemstones: Its diameter - 58,4 cm. Until 1917 several ancient regalia served as heraldic crowns of various lands of the Russian Empire. Great Imperial Crown - at the top, on imperial mantle. The crown of "Grand set" - on shield of the coat of arms of Astrahan Tsardom. 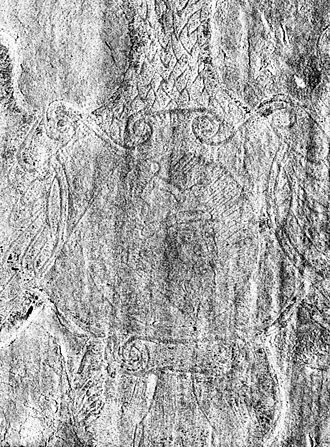 Altabas crown - on shield on the coat of arms of Siberia. Lost "Georgian Crown" - on shield on the coat of arms of Georgia. 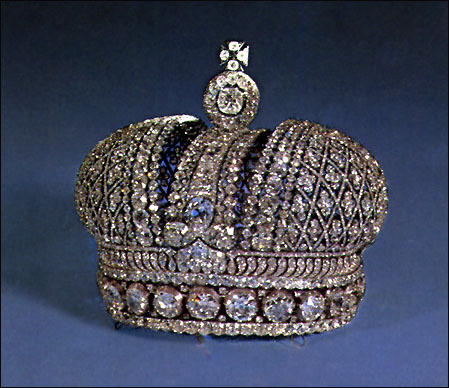 This crown was demolished or sold by the Soviets in the 1930s. Only heraldic crown - on shield on the coat of arms of Finland. Only heraldic crown - on shield on the family coat of arms of House Holstein-Hottorp-Romanov. "Cap of Monomakh" - on shield of the coat of arms of "Tsardom of Great, Little and White Russia". "Cap of Monomakh of the second set" - on shield of the coat of arms of Crimea. 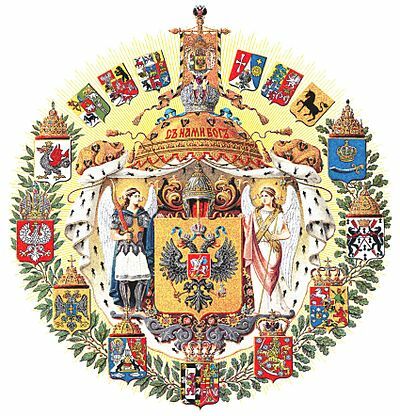 Crown of Empress Anna Ivanovna - on shield of the coat of arms of Poland. Kazan crown - on shield of the coat of arms of Kazan Tsardom. "State helmet" of Michael Fyodorovich - in center, on shield of the small coat of arms of Russian Empire. Also, Maltese crown served as heraldic until 1803. It can be still found in coat of arms of the Russian town of Gatchina. ^ Kvasha, Semyon (1 May 2013). "Treasures of Imperial Russia on display in Moscow and St. Petersburg". Retrieved 19 September 2014. Wikimedia Commons has media related to Great Imperial Crown. Tourmaline is a crystalline boron silicate mineral compounded with elements such as aluminium, magnesium, lithium, or potassium. Tourmaline is classified as a stone and the gemstone comes in a wide variety of colors. The name comes from the Tamil and Sinhalese word Turmali or Thoramalli, brightly colored Sri Lankan gem tourmalines were brought to Europe in great quantities by the Dutch East India Company to satisfy a demand for curiosities and gems. At the time it was not realised that schorl and tourmaline were the same mineral, tourmaline was sometimes called the Ceylonese Magnet because it could attract and repel hot ashes due to its pyroelectric properties. Tourmalines were used by chemists in the 19th century to light by shining rays onto a cut. It may account for 95% or more of all tourmaline in nature, the early history of the mineral schorl shows that the name schorl was in use prior to 1400 because a village known today as Zschorlau was named Schorl. This village had a tin mine where, in addition to cassiterite. The first description of schorl with the name schürl and its occurrence was written by Johannes Mathesius in 1562 under the title Sarepta oder Bergpostill, up to about 1600, additional names used in the German language were Schurel, Schörle, and Schurl. Beginning in the 18th century, the name Schörl was mainly used in the German-speaking area, in English, the names shorl and shirl were used in the 18th century. In the 19th century the names common schorl, schörl, dravite, called brown tourmaline, is the sodium magnesium rich tourmaline endmember. 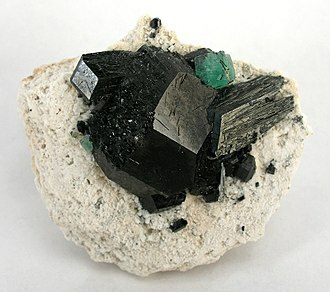 Uvite, in comparison, is a calcium magnesium tourmaline, dravite forms multiple series, with other tourmaline members, including schorl and elbaite. Today this tourmaline locality at Dravograd, is a part of the Republic of Slovenia, tschermak gave this tourmaline the name dravite, for the Drava river area, which is the district along the Drava River in Austria and Slovenia. Dravite varieties include the green chromium dravite and the vanadium dravite. From 1551 to 1700, Russia grew 35,000 km2 per year. After a military victory over Sweden and Poland, he implemented substantial reforms and proclaimed the Russian Empire in 1721. While the oldest endonyms of the Grand Duchy of Moscow used in its documents were Rus and the Russian land, in the 1480s Russian state scribes Ivan Cherny and Mikhail Medovartsev mention Russia under the name Росиа, Medovartsev mentions the sceptre of Russian lordship. In England of the 16th century, it was both as Russia and Muscovy. 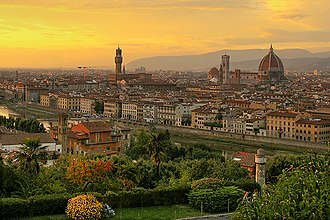 In Northern Europe and at the court of the Holy Roman Empire, muscovites refute this, saying that their country was originally called Russia. When they are asked what nation they are, they respond Russac, which means Russians, and when they are asked what place they are from, by the 16th century, the Russian ruler had emerged as a powerful, autocratic figure, a Tsar. By assuming that title, the sovereign of Moscow tried to emphasize that he was a ruler or emperor on par with the Byzantine emperor or the Mongol khan. At first, the Byzantine term autokrator expressed only the meaning of an independent ruler. 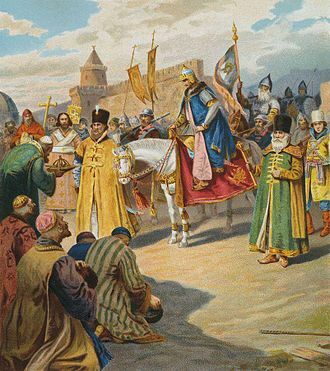 Ivan IV was crowned Tsar and thus was recognized, at least by the Russian Orthodox Church and that concept was to resonate in the self-image of Russians in future centuries. The development of the Tsars autocratic powers reached a peak during the reign of Ivan IV, Ivan strengthened the position of the Tsar to an exceptional degree, demonstrating the risks of unrestrained power in the hands of a mentally unstable individual. Although apparently intelligent and energetic, Ivan suffered from breakdowns of paranoia and depression, Ivan IV became Grand Prince of Moscow in 1533 at the age of three. The Shuysky and Belsky factions of the boyars competed for control of the regency until Ivan assumed the throne in 1547, reflecting Moscows new imperial claims, Ivans coronation as Tsar was a ritual modeled after those of the Byzantine emperors. With the continuing assistance of a group of boyars, Ivan began his reign with a series of useful reforms, in the 1550s, he declared a new law code, revamped the military, and reorganized local government. Its counterpart is the New Testament, the second part of the Christian Bible. The books that comprise the Old Testament canon differ between Christian Churches as well as their order and names. The most common Protestant canon comprises 39 books, the Catholic canon comprises 46 books, the 39 books in common to all the Christian canons corresponds to 24 books of the Tanakh, with some differences of order, and there are some differences in text. The additional number reflects the split of texts in the Christian Bibles into separate books, for example, Kings and Chronicles, Ezra–Nehemiah, the books which are part of a Christian Old Testament but which are not part of the Hebrew canon are sometimes described as deuterocanonical. In general, Protestant bibles do not include books in its canon. The Old Testament consists of translations of many books by various authors produced over a period of centuries. The canon formed in stages, first the Pentateuch by around 400 BC, the Prophets during the Hasmonean dynasty, and finally the remaining books. The Old Testament contains 39 or 46 or more books, very broadly, into the Pentateuch, the books, the wisdom books. For the Orthodox canon, Septuagint titles are provided in parentheses when these differ from those editions, for the Catholic canon, the Douaic titles are provided in parentheses when these differ from those editions. Likewise, the King James Version references some of these books by the spelling when referring to them in the New Testament. The Talmud in Bava Batra 14b gives a different order for the books in Neviim and Ketuvim and this order is cited in Mishneh Torah Hilchot Sefer Torah 7,15. The order of the books of the Torah is universal through all denominations of Judaism and they are present in a few historic Protestant versions, the German Luther Bible included such books, as did the English 1611 King James Version. Empty table cells indicate that a book is absent from that canon, several of the books in the Eastern Orthodox canon are found in the appendix to the Latin Vulgate, formerly the official Bible of the Roman Catholic Church. Boris Fyodorovich Godunov ruled the Tsardom of Russia as de facto regent from c.1585 to 1598 and as the first non-Rurikid tsar from 1598 to 1605. The end of his reign saw Russia descend into the Time of Troubles, Boris Godunov was the most noted member of an ancient, now extinct, Russian family of Tatar origin, which came from the Horde to Kostroma in the early 14th century. This legend is written in the annals dating from early 17th century and he was descended from the Tatar Prince Chet, who went from the Golden Horde to Russia and founded the Ipatiev Monastery in Kostroma. Boris was the son of Feodor Ivanovich Godunov Krivoy and his wife Stepanida Ivanovna and his older brother Vasily died young and without issue. 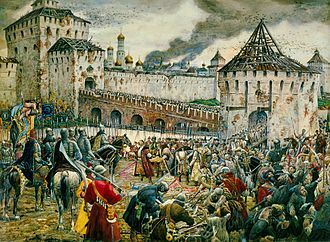 Godunovs career began at the court of Ivan the Terrible and he is mentioned in 1570 for taking part in the Serpeisk campaign being an archer of the guard. The following year, he became an oprichnik – a member of Ivans personal guard, in 1570/1571, Godunov strengthened his position at court by his marriage to Maria Grigorievna Skuratova-Belskaya, the daughter of oprichniks head Malyuta Skuratov-Belskiy. In 1580, the Tsar chose Boris Godunovs sister Irina Godunova to be the wife of his son and eventual heir. On this occasion, Godunov was promoted to the rank of Boyar, on 15 November 1581, he was present at the scene of the Tsars murder of his own eldest son, the crown prince Ivan. Godunov tried to intervene, but received blows from the Tsars sceptre, the elder Ivan immediately repented and Godunov rushed to get help for the Tsarevich, who died four days later. Upon his death, Ivan left the three-year-old Dmitry Ivanovich, from his seventh, since the Orthodox Church recognized legitimate only his first three marriages, and any offspring thereof, Dmitri had no claim to the throne. Still, taking no chances, shortly after Ivans death the Council had both Dmitri and his mother Maria Nagaya moved to Uglich, some 120 miles north of Moscow and it was there in 1591 that Dmitri died at the age of ten. An official commission headed by Vasili Shuiski was sent to determine the cause of death, the official verdict was that the boy had cut his throat during an epileptic seizure. Turquoise is an opaque, blue-to-green mineral that is a hydrated phosphate of copper and aluminium, with the chemical formula CuAl648·4H2O. It is rare and valuable in finer grades and has been prized as a gemstone, in recent times, turquoise has been devalued, like most other opaque gems, by the introduction onto the market of treatments and synthetics. Pliny the Elder referred to the mineral as callais and the Aztecs knew it as chalchihuitl, the finest of turquoise reaches a maximum Mohs hardness of just under 6, or slightly more than window glass. Characteristically a cryptocrystalline mineral, turquoise almost never forms single crystals and its crystal system is proven to be triclinic via X-ray diffraction testing. With lower hardness comes lower specific gravity and greater porosity, These properties are dependent on grain size, the lustre of turquoise is typically waxy to subvitreous, and transparency is usually opaque, but may be semitranslucent in thin sections. Colour is as variable as the other properties, ranging from white to a powder blue to a sky blue. The blue is attributed to idiochromatic copper while the green may be the result of either iron impurities or dehydration, a reading of 1. 61–1.65 has been taken from rare single crystals. An absorption spectrum may be obtained with a spectroscope, revealing a line at 432 nm. Under longwave ultraviolet light, turquoise may occasionally fluoresce green, yellow or bright blue, it is inert under shortwave ultraviolet, Turquoise is insoluble in all but heated hydrochloric acid. Its streak is a bluish white and its fracture is conchoidal. Despite its low relative to other gems, turquoise takes a good polish. 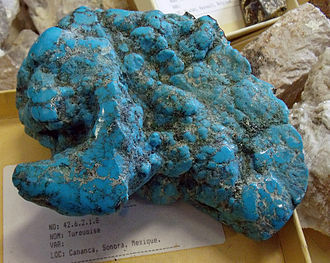 Turquoise may be peppered with flecks of pyrite or interspersed with dark, as a secondary mineral, turquoise apparently forms by the action of percolating acidic aqueous solutions during the weathering and oxidation of preexisting minerals. 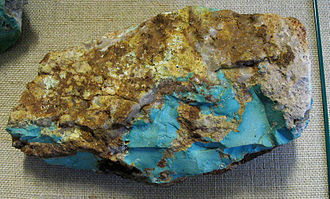 In the Southwestern United States turquoise is almost invariably associated with the products of copper sulfide deposits in or around potassium-feldspar-bearing porphyritic intrusives. The Khanate of Kazan was a medieval Bulgarian-Tatar Turkic state that occupied the territory of former Volga Bulgaria between 1438 and 1552. Its khans were the descendants of Tugh Temür, the thirteenth son of Jochi. The khanate covered contemporary Tatarstan, Mari El, Mordovia and it was one of the successor states of the Golden Horde, and it came to an end when it was conquered by the Tsardom of Russia. The territory of the khanate comprised the Muslim Bolgar-populated lands of the Bolğar, Cükätäw, the Volga and Vyatka were the main rivers of the khanate, as well as the major trade ways. The majority of the population were Kazan Tatars and their self-identity was not restricted to Tatars, many identified themselves simply as Muslims or as the people of Kazan. The local feudal nobility consisted of ethnic Bolgars, but the court, according to the Ginghizide tradition, the local Turkic tribes were called Tatars by the steppe nobility and, later, by the Russian elite. Part of the higher nobility hailed from the Golden Horde and it included members of four leading noble families, Barin and Shirin. Peoples subject to the khan included the Chuvash, Mordva, Tatar-Mishar, the Permians and some of the Komi tribes were incorporated into the Khanate. The Mishars had arrived during the period of the Golden Horde and gradually assimilated the resident Finnic Mordvins and their territory was governed by former steppe Tatars. Some Mishar duchies were never controlled from Kazan and instead gravitated towards the Qasim Khanate or Muscovite Russia, most of the khanate territory was covered by forests, and only the southern part adjoined the steppe. Later, Nogais were transplanted and replaced with Kalmyks, more recently, this area was settled by Tatars and Russians, who erected defensive walls to guard the southern border. Since the khanate was established, Tatar Cossack troops defended the khanate from the Nogais, Russian sources indicate that at least five languages were used in the Kazan khanate. The first and foremost was the Tatar language, including the Middle dialect of the Kazan Tatars and its written form was the favoured language of the state. 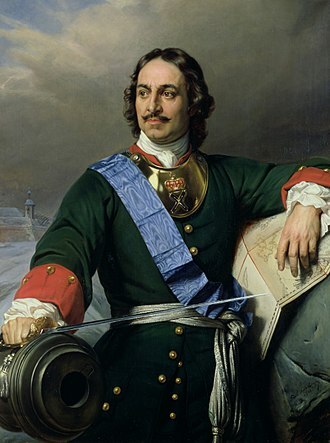 The government reforms of Peter I were aimed at modernizing the Tsardom of Russia based on Western and Central European models. 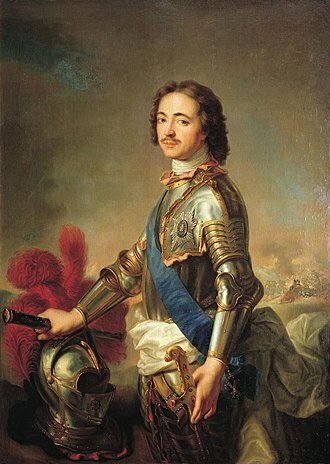 Peter ascended to the throne in 1682, he ruled jointly with his half-brother Ivan V, after Ivans death in 1696, Peter started his series of sweeping reforms. At first, these reforms were intended to support the Great Northern War, despite Russias vast size and considerable natural resources, a number of factors, including corruption and inefficiency, hampered economic growth. Peter believed that targeted reform could not only strengthen his hold on power, but increase the efficiency of the government, another major goal of Peters reform was reducing the influence of the Boyars, Russias elite nobility, who stressed Slavic supremacy and opposed European influence. While their clout had declined since the reign of Ivan the Terrible, the Boyar Duma, Peter saw them as backward, standing in the way of Europeanization and reform. He specifically targeted the boyars with numerous taxes and obligatory services, like most of Russias legal system at the time, Peters reforms were codified and articulated in a series of royal decrees, issued chiefly between 1700 and 1721. 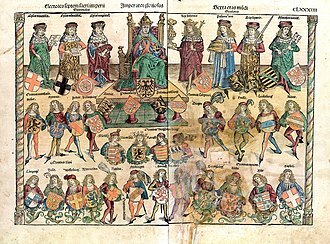 Prior to Peters rule, Russias administrative system was relatively antiquated compared to that in many Western European nations, the state was divided into uyezds, which mostly consisted of cities and their immediate surrounding areas, this system divided the population unevenly and was extremely clumsy to manage. In 1708, Peter abolished these old national subdivisions and established in their place eight governorates, Ingermanland, Smolensk, Kazan and Siberian. Another decree in 1713 established Landrats in each of the governorates, Peters distrust of the elitist and anti-reformist Boyars culminated in 1722 with the creation of the Table of Ranks, a formal list of ranks in the Russian military and royal court. The Table of Ranks established a system of titles and honorifics. The origins of the Table of Ranks lie in Russias military ranking system, the establishment of the Table of Ranks was among the most audacious of Peters reforms, a direct blow to the power of the Boyars which changed Russian society significantly. A new generation of technocrats soon supplanted the old Boyar class, with minimal modifications, the Table of Ranks remained in effect until the Russian Revolution of 1917. Peters government was constantly in dire need of money, and at first it responded by monopolizing certain strategic industries, such as salt, oak, Peter taxed many Russian cultural customs and issued tax stamps for paper goods. However, with new tax came new loopholes and new ways to avoid them. The solution was a new poll tax, which replaced a household tax on cultivated land. Previously, peasants had skirted the tax by combining several households into one estate, however, each peasant was assessed individually for a tax of 70 kopeks, paid in cash. This was significantly heavier than the taxes it replaced, and it enabled the Russian state to expand its treasury almost sixfold between 1680 and 1724, Peter pursued proto-protectionist trade policies, placing heavy tariffs on imports and trade to maintain a favorable environment for Russian-made goods. A pearl is a hard object produced within the soft tissue of a living shelled mollusk or another animal, such as a conulariid. Just like the shell of a clam, a pearl is composed of calcium carbonate. in minute crystalline form, the ideal pearl is perfectly round and smooth, but many other shapes, known as baroque pearls, can occur. The finest quality natural pearls have been valued as gemstones. 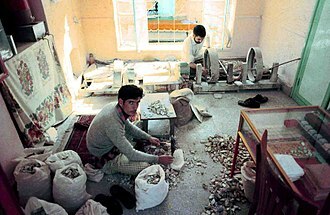 Because of this, pearl has become a metaphor for something rare, the most valuable pearls occur spontaneously in the wild, but are extremely rare. These wild pearls are referred to as natural pearls, cultured or farmed pearls from pearl oysters and freshwater mussels make up the majority of those currently sold. Imitation pearls are widely sold in inexpensive jewelry, but the quality of their iridescence is usually very poor and is easily distinguished from that of genuine pearls. Pearls have been harvested and cultivated primarily for use in jewelry and they have been crushed and used in cosmetics and paint formulations. Whether wild or cultured, gem-quality pearls are almost always nacreous and iridescent, almost all species of shelled mollusks are capable of producing pearls of lesser shine or less spherical shape. The English word pearl comes from the French perle, originally from the Latin perna meaning leg, nacreous pearls, the best-known and most commercially significant, are primarily produced by two groups of molluskan bivalves or clams. A nacreous pearl is made from layers of nacre, by the same living process as is used in the secretion of the mother of pearl which lines the shell, natural pearls, formed without human intervention, are very rare. Cultured pearls are formed in pearl farms, using human intervention as well as natural processes, saltwater pearls can grow in several species of marine pearl oysters in the family Pteriidae. Freshwater pearls grow within certain species of mussels in the order Unionida. The unique luster of pearls depends upon the reflection, the thinner and more numerous the layers in the pearl, the finer the luster. Monomakhs Cap, called the Golden Cap, is a chief relic of the Russian Grand Princes and Tsars. It is a symbol-crown of the Russian autocracy, and is the oldest of the crowns currently exhibited at the Kremlin Armoury, the cap is surmounted by a simple gold cross with pearls at each of the extremities. 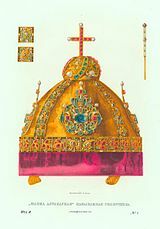 It is not to be confused with the Monomachus Crown in Budapest, boris Uspensky, in particular, argues that the Tatar headgear was originally used in coronation ceremonies to signify the Muscovite rulers subordination to the khan. According to Sergey Solovyov after the death of Ivan Kalita all Russian princes traveled to the Horde. and the Khan announced the eldest son of Kalita, the Grand Prince of Vladimir. Also Solovyov writes that the first who introduced the coronation of the Russian monarch was Ivan III, at some point in the 15th or 16th century the crown was surmounted by a cross. The legend was elaborated in The Tale of the Princes of Vladimir, the crown became known as Monomakhs Cap, the term first recorded in a Russian document from 1518. Shah is a title given to the emperors, kings and lords of Iran. In Iran the title was used, rather than King in the European sense. The full, Old Persian title of the Achaemenid rulers of the First Persian Empire was Xšāyathiya Xšāyathiyānām or Šāhe Šāhān and this word is commonly confused with the unrelated and distinct Indian surname Shah, which is derived from the Sanskrit Sadhu or Sahu, meaning gentleman. Šāh, or Šāhanšāh to use the term, was the title of the Persian emperors. While the Ottoman Sultans never styled themselves as Shah, but rather Sultan, their male offspring received the title of Şehzade, or prince. The full title of the Achaemenid rulers was Xšāyaθiya Xšāyaθiyānām, literally King of Kings in Old Persian, corresponding to Middle Persian Šāhān Šāh, in Greek, this phrase was translated as βασιλεὺς τῶν βασιλέων, King of Kings, equivalent to Emperor. Both terms were often shortened to their roots shah and basileus, in Western languages, Shah is often used as an imprecise rendering of Šāhanšāh. The term was first recorded in English in 1564 as a title for the King of Persia, for a long time, Europeans thought of Shah as a particular royal title rather than an imperial one, although the monarchs of Persia regarded themselves as emperors of the Persian Empire. In the twentieth century, the Shah of Persia, Mohammad Reza Pahlavi, officially adopted the title شاهنشاه Šāhanšāh and, in western languages and he styled his wife شهبانو Shahbānu. Iran no longer had a shah after the 1979 Islamic Revolution, from the reign of Ashot III, the Bagratid kings of Armenia used the title shahanshah, meaning king of kings. The title padishah was adopted from the Iranians by the Ottomans and by other monarchs claiming imperial rank. Another subsidiary style of the Ottoman and Mughal rulers was Shah-i-Alam Panah, meaning King, the Shah-Armens, used the title Shāh-i Arman. Georgian title mepetmepe was inspired by the shahanshah title, however the precise full styles can differ in the court traditions of each shahs kingdom. King Haakon VII and Queen Maud of Norway with their regalia. Batu Khan on the throne of the Golden Horde. Warriors of the Golden Horde sack Suzdal. Gold histamenon of Zoë and Theodora, 1042. The Oprichniki by Nikolai Nevrev. The painting shows the last minutes of boyarin Feodorov, arrested for treason. To mock his alleged ambitions on the Tsar's title, the nobleman was given Tsar's regalia before execution. 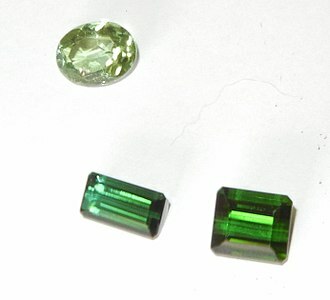 Two dark green rectangular tourmaline stones and one oval tourmaline stone. 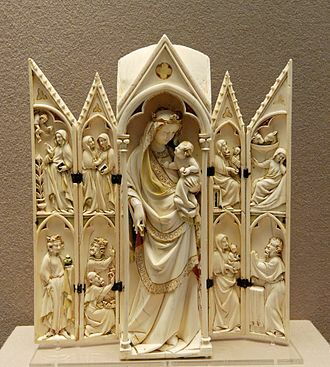 The solid ivory image of Our Lady of Manaoag in her imperial regalia. 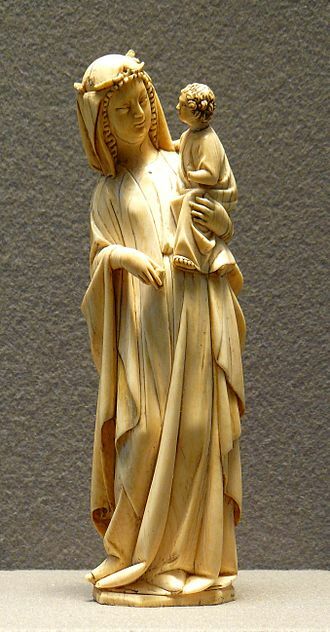 Genuine ivory is held more valuable than gold among Santero artisans. Pangasinan, Philippines. Shah Abbas I and his court. Shah ‘Abbās King of the Persians. 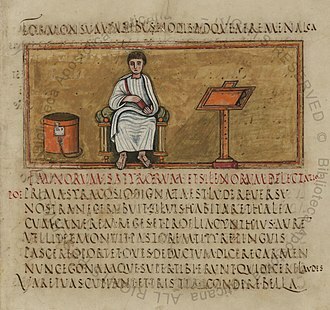 Copper engraving by Dominicus Custos, from his Atrium heroicum Caesarum pub. 1600–1602. Anthony Shirley and Robert Shirley (pictured in 1622) helped modernize the Persian Army. No known portrait of Godunov exists from life. A likeness by artist and historian George S. Stuart created from his physical description mentioned in historical records. A cope in pile-on-pile velvet. The portrait of Elizabeth as Venus, painted in the 1710s for the Grand Peterhof Palace. Promenade of Elizaveta Petrovna through the streets of Saint Petersburg (1903), watercolour by Alexandre Benois. Nikolay Sergeyev. "Apple blossom. In Little Russia." 1895. Oil on canvas. "In Little Russia". Photo by Sergey Prokudin-Gorsky, between 1905 and 1915. The Söyembikä Tower in Kazan possibly displays some features of medieval Kazan architecture. Archduke Rudolf, aged 15, painted by Alonso Sánchez Coello.